The BAE-14/28 turbo alternator is available for the following Piper Aircraft models: PA-28 & PA-32. The BPE-14 turbo alternator is available for these models: J3, PA-11, PA-15 & PA-18. For more information on the Piper Aircraft please use the links below. The Piper PA-28 Cherokee is a family of light aircraft designed for flight training, air taxi and personal use, built by Piper Aircraft. All members of the PA-28 family are all-metal, unpressurized, four-seat, single-engine piston-powered airplanes with low-mounted wings and tricycle landing gear. All PA-28 aircraft have a single door on the co-pilot side, which is entered by stepping on the wing. The first PA-28 received its type certificate from the FAA in 1960 and the series remains in production in 2009. Current models are the Arrow and Warrior III. The Archer was discontinued in 2009, but with investment from new Piper owners Imprimis, will be revived in 2010. Competition for the PA-28 series include the Cessna 172, the Grumman American AA-5 series and the Beechcraft Musketeer. Piper has created variations within the Cherokee family by installing engines ranging from 140 to 300 hp (105-220 kW), providing turbocharging, offering fixed or retractable landing gear, fixed-pitch or constant speed propellers, and stretching the fuselage to accommodate 6 people. The larger, six-seat variant of the PA-28 is generally the PA-32; earlier versions were known as the "Cherokee Six," and a PA-32 version is still in production today under the model name Saratoga. The above content is based on the copyrighted Wikipedia article Piper PA-28; it is used under the Creative Commons Attribution-ShareAlike 3.0 Unported License (CC-BY-SA). You may redistribute it, verbatim or modified, providing that you comply with the terms of the CC-BY-SA. The Piper PA-32 Cherokee Six is a series of six or seven seat, fixed or retractable landing gear, light aircraft, that was manufactured in the United States by Piper Aircraft between 1965 and 2007. The above content is based on the copyrighted Wikipedia article Piper PA-32; it is used under the Creative Commons Attribution-ShareAlike 3.0 Unported License (CC-BY-SA). You may redistribute it, verbatim or modified, providing that you comply with the terms of the CC-BY-SA. The above content is based on the copyrighted Wikipedia article Piper J-3; it is used under the Creative Commons Attribution-ShareAlike 3.0 Unported License (CC-BY-SA). You may redistribute it, verbatim or modified, providing that you comply with the terms of the CC-BY-SA. The airframe is basically the same as a J-3, however, the engine mount is slightly lower, the windshield more sloped, the cowling is fully closed and the fuel tank was raised and placed in the port wing. Both seats were slightly moved back, and solo flying was usually from the front seat. Early PA-11s had a Continental A65-8 engine, while the later ones had the option of a Continental C90-8. Several current-production light-sport aircraft are being produced based on this configuration. On the early PA-11s, the fuselage was painted with a metallic blue on the lower half the rest being Lock Haven Yellow. The later PA-11s were all yellow with a simple brown stripe. 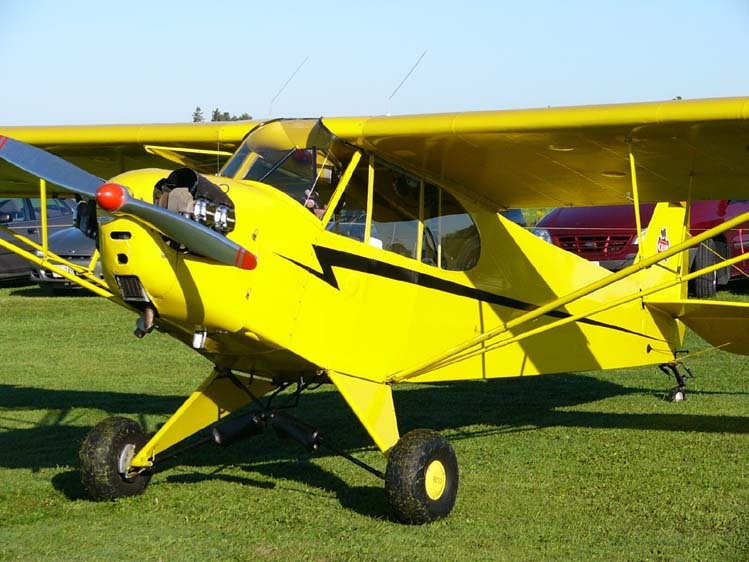 The aircraft formed the basis for the next evolution in the Piper Cub series: The Piper PA-18 Super Cub. The PA-11 and its successor, the PA-18-95, share many common traits. With a gross weight of 1,220 lbs. and average empty weight of 850 lbs., the PA-11 is a light enough to perform well, yet heavy enough to maneuver easily in more wind than the lighter J-3 Cub. The PA-11 is capable of short takeoffs and landings, yet has a respectable cruise speed for its configuration. Given that the PA-11 falls into the modern day category of light sport aircraft it is a popular airplane to acquire and commands a premium price. The above content is based on the copyrighted Wikipedia article Piper PA-11; it is used under the Creative Commons Attribution-ShareAlike 3.0 Unported License (CC-BY-SA). You may redistribute it, verbatim or modified, providing that you comply with the terms of the CC-BY-SA. The Piper PA-15 Vagabond and PA-17 Vagabond are both two seat, high wing, conventional gear light aircraft that were designed for personal use and for flight training and built by Piper Aircraft starting in 1948. The PA-15 was the first post-World War II Piper aircraft design. It utilized much of the same production tooling that created the famous Piper Cub, as well as many of the Cub structural components (tail surfaces, landing gear, most of the wing parts). The Vagabond has a wing that is one bay shorter (~30 feet versus 36 feet) than that on the Cub, which lead to the unofficial designation of Short-wing Piper. This allowed the aircraft to be built with minimal material, design and development costs, and is credited with saving Piper Aircraft from bankruptcy after the war. Vagabonds used a new fuselage with side-by-side seating for two instead of the Cubs' tandem (fore and aft) seating. The PA-17 Vagabond version features dual controls, enabling it to be used for pilot training. It has a bungee cord shock-absorbed undercarriage (solid gear on the PA-15), and a 65 hp Continental A-65 engine. The above content is based on the copyrighted Wikipedia article Piper PA-15; it is used under the Creative Commons Attribution-ShareAlike 3.0 Unported License (CC-BY-SA). You may redistribute it, verbatim or modified, providing that you comply with the terms of the CC-BY-SA. While based on the design of the earlier Cubs, the addition of an electrical system, flaps (3 notches), and a vastly more powerful engine (150hp), make it a very different flying experience. Although the "standard" Super Cub was fitted with a 150 horsepower (112 kW) Lycoming engine, it was not uncommon to see them equipped with a 180 hp (134 kW) powerplant. The high-lift wing and powerful engine made the Super Cub a prime candidate for conversion to either floatplane or skiplane. In addition, the PA-18A (an agricultural version) was produced for applying either dry chemical or liquid spray. The first true "Super" Cubs had flaps, dual fuel tanks, and an O-235 Lycoming engine producing about 108 hp (115 hp for takeoff only). However, a 90 hp Continental without flaps and an optional second wing tank was available. Their empty weight was, on the average, 800-1000 pounds with a gross weight of 1,500 lb. These Cubs would take off in about 400 feet (at gross weight) and land in about 300 feet (thanks to the flaps). The Super Cub is renowned for its ability to take off and land in very short distances. With a light wing loading some can take off in 50 feet and land in 30. The O-290 Lycoming powered Cubs (135 hp) followed and would take off in about 200 feet. The landing distance remained the same at about 400 feet, or 300 feet using flaps. With the use of the Lycoming O-320 at 150-160 hp, the Cub's allowable gross weight increased to 1,750 lb while retaining the capability of a mere 200 feet for takeoff. The above content is based on the copyrighted Wikipedia article Piper PA-18; it is used under the Creative Commons Attribution-ShareAlike 3.0 Unported License (CC-BY-SA). You may redistribute it, verbatim or modified, providing that you comply with the terms of the CC-BY-SA.